Curiosity’s Roving Along an Ancient Riverbed! Not even two months after landing on Mars, NASA’s Curiosity rover has already found good evidence that water once flowed within Gale Crater! And not just as a random occurrence either, but an honest-to-goodness stream… long-lived and possibly hip-deep, according to both rocks and researchers. 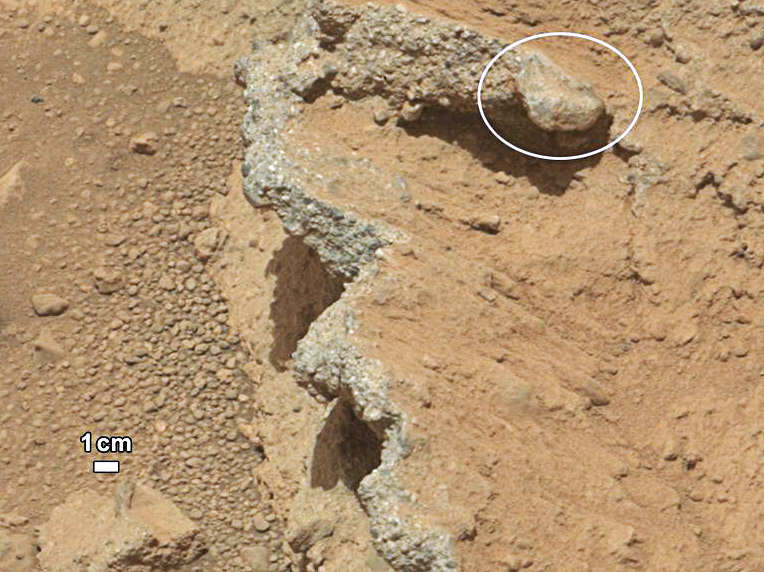 The image above shows a rocky outcropping that Curiosity came across on September 14. The small shelf sticks out from the Martian soil at an angle and appears to be made up of bits of bedrock cemented together, a material known as sedimentary conglomerate. While the angle is thought to have been caused by the disruptive force of a meteorite impact, the small rounded pebbles (that geologists call “clasts”) that are not only embedded in the rock but are also piled up below its lip are believed to be evidence of a “vigorous” flow of water. 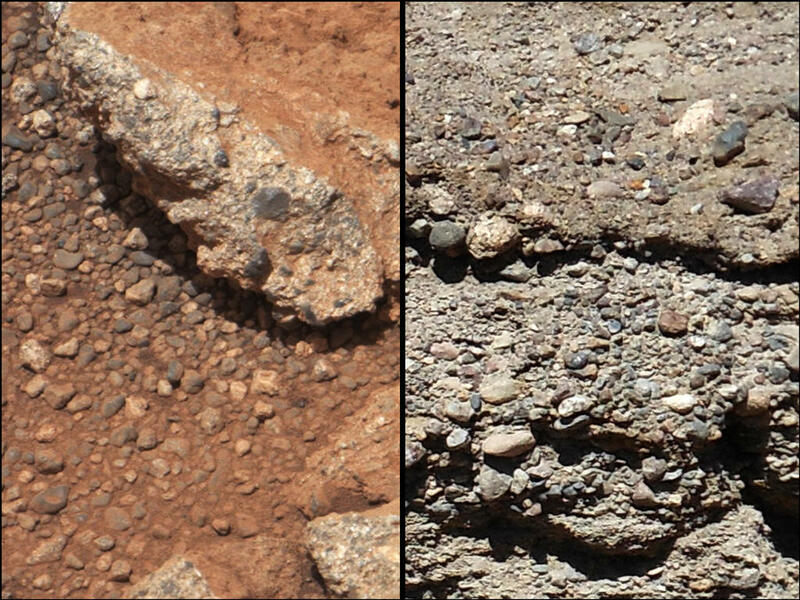 “Hottah looks like someone jack-hammered up a slab of city sidewalk, but it’s really a tilted block of an ancient streambed,” said Mars Science Laboratory Project Scientist John Grotzinger. “The shapes tell you they were transported and the sizes tell you they couldn’t be transported by wind. They were transported by water flow,” said co-investigator Rebecca Williams. Needless to say, this is HUGE. While not liquid water in the present sense, it shows that water did flow on Mars at some point in the distant past, long enough to affect the landscape and cause erosive processes that can be seen today. And where there’s water, there’s always the chance that conditions were right for life as we know it. And to think it’s only been 7 weeks since Curiosity first set wheels on Mars. This is going to be one incredible mission! It’s happening!!! MSL is doing the science on Mars!